Each year, around 2,400 kids are sent to the hospital with electrical shocks and burns. 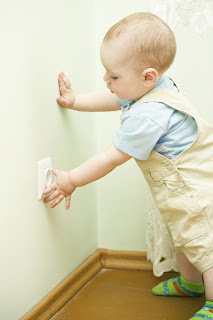 We all know how curious children can be, especially when it comes to sticking foreign objects into an outlet. Even if you have your eye on them all day long, a serious tragedy can occur if you look away for just a second. That’s why you need to childproof your home with tamper-resistant outlets. If you took a quick look at a tamper-resistant receptacle, you would probably say it looks just like any other outlet in the house. So, what makes it different? These outlets are equipped with spring-loaded shutters that close receptacle openings when nothing is plugged in. In order for the springs to open, equal pressure must be exerted into both openings, which is what happens when you plug in an electrical device. While some homeowners have been using plastic plugs to keep their children’s fingers and toys out of harm’s way, you still have to remove them each time you want to plug something in which can become a nuisance. Additionally, these plugs can be a choking hazard if your child figures out how to unplug them. Tamper-resistant receptacles are a safer and more efficient option when it comes to preventing electrical shocks and burns. Ready to have them installed in your home? Contact the expert electricians at GEN3 Electric to schedule an appointment today! The safety of the electric devices is an important factor in preventing the severe burns. They can appear because of the improper use of equipment.